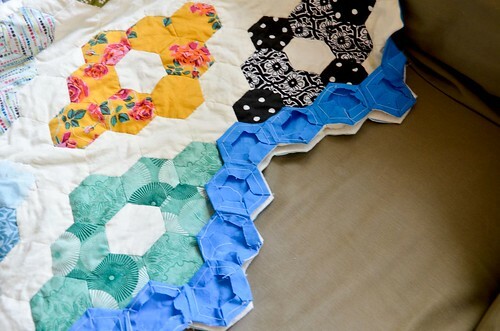 I really liked this tutorial by badskirt on finishing your hexagon quilts, only my hexagon quilt is so large I needed to slightly adapt this approach to my purposes. So, here's my own version of badskirt's not-grandma-approved quilt binding. 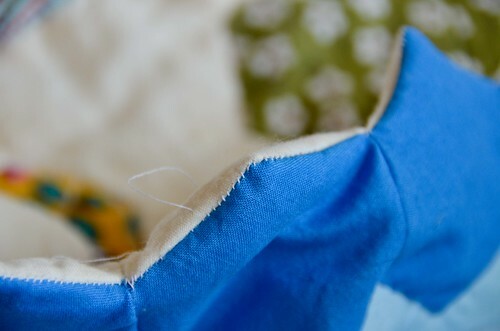 This approach has some pros (funky shaped quilt edges, no need to miter a million binding corners, no need to cut off hand-stitched work) and some cons (the seam on the edge, rather than a fold-over binding, makes this finishing technique weaker than standard finish approaches). So. Just keep that in mind. 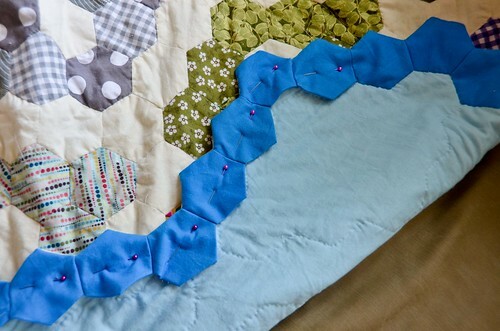 I like to whipstitch my binding/back-side hexagon (in blue) to the quilt top hexagons (in white) in two phases: (1) sew along all the blue & white hexagons with white thread, and (2) attach the blue hexagons to each other with blue thread. I place a blue hexagon on top of a front-side hexagon (white) with the right sides facing. 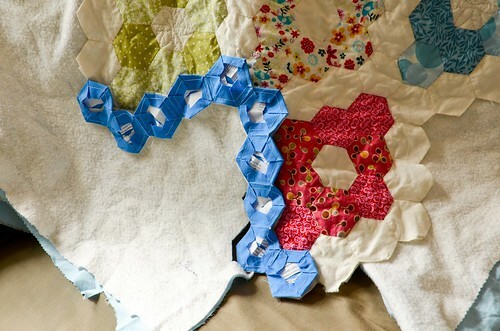 And then use a whipstitch to attach the blue hexagon to the white hexagon. I pick up another blue hexagon, and do the same. In this way, you'll have a bunch of blue hexagons attached to the white hexagons, but then they won't be connected to each other. 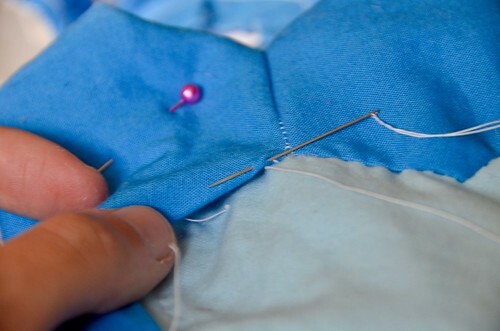 Then, I use some blue thread to whipstitch the touching blue edges together, making sure to reinforce the corners where the four hexagons meet. Sometimes I have to take out a hexagon's paper and undo its basting to reshape it to fit its neighbor hexagon. 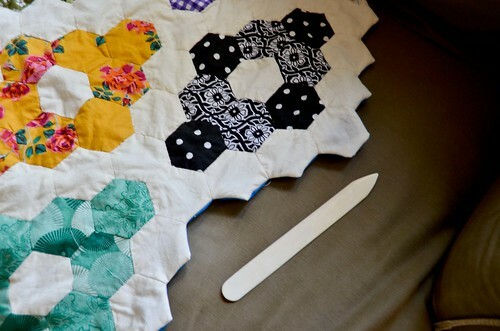 If you're using hand-made hexagon templates, you might have to do the same! 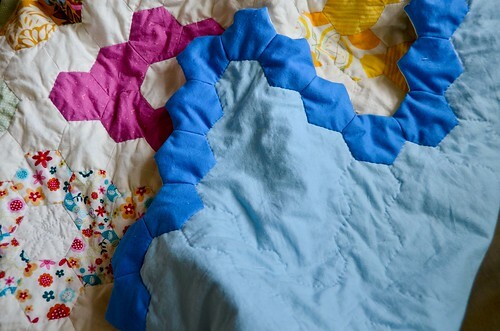 It's important to notice that this process is slightly different from piecing a hexagon quilt as you want the blue hexagons to overlap exactly with the white hexagons on which they're placed. At this point, I like to trim the excess batting off, to make the batting & backing match the size of the quilt top. Sometimes I have to cut tiny little slits in the batting at the corners, so that any excess doesn't pile up inside the binding. I only do one of the four sides at a time, usually. And then trim the batting again when I reach the next side, etc. 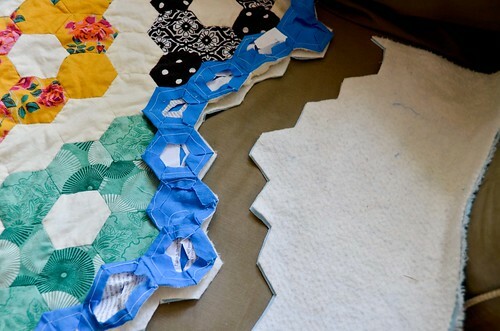 Now you've got all the blue hexagons sewn to the white hexagons, all around your quilt, and the blue hexagon edges all secured to each other. Your quilt top should already have all its paper templates removed, since you've already quilted it. So, now you can remove the paper templates from about ~15 blue hexagons. And then proceed with the next steps. 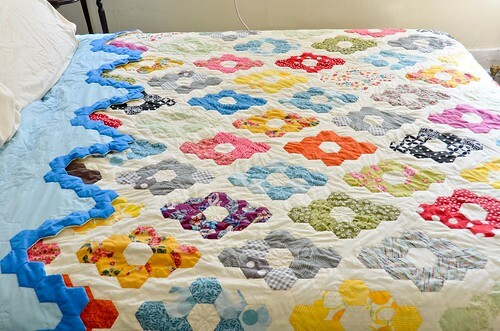 Now you can flip the blue hexagons right-side-out, so they fold underneath the quilt top and over the batting and backing. In order to get nice, crisp hexagon edges, it is best to use some sort of implement (like a bone folder) to press at the seams a bit and make sure all the corners are nice and pointy. Using some pins, secure the binding in place so there isn't any puckering or bunching. I like to only pin about 8 hexagons at a time. Then I pin the next 8 when I get to them. TurningTurning has a nice tutorial on using ladder stitch for securing binding invisibly. 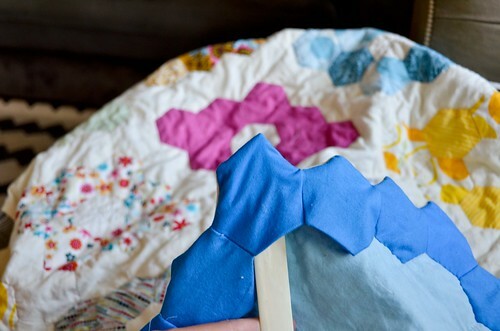 This is pretty much what I did to secure my blue hexagon binding to the back of the quilt. I typically secured both my starting thread and knotting off of a thread with a quilter's knot, using the same process that is typically used during the quilting. Since you only prepped about ~15 blue hexagons in Step 3, when you run out of hexagons to secure, go back to Step 3 and do ~15 more! After you secure your last thread with a quilter's knot, you're done the binding! 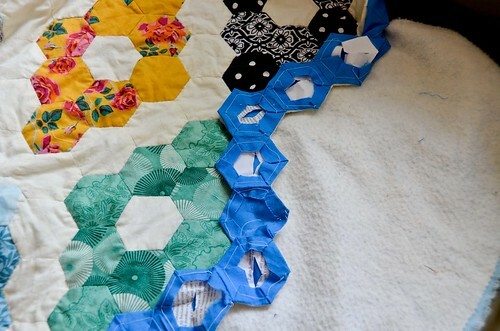 It should leave you with hexagon-ish edges and should be invisibly secured to the back of the quilt. Oh my goodness, it's perfect! What a great way to finish it!